Until this New Year, I’d not completed a Jigsaw puzzle for about a million years. Last year I had played with a few iPad Jigsaw puzzles, but although I enjoyed doing them, I found the process difficult and frustrating, due to the limited space. Early in the New Year, when we stayed in a Staffordshire cottage with Karen and Dave, Karen and I had a go at one she’d been given for Christmas (or which she found in the cottage – who knows!) Now, I enjoyed that and found it quite relaxing. Another friend, Carol, who does Jigsaws all the time, insists that they help to maintain our memory function as we grow older, I do hope so! They certainly help with concentration. Carol gave me a puzzle to get started with – and off I went. 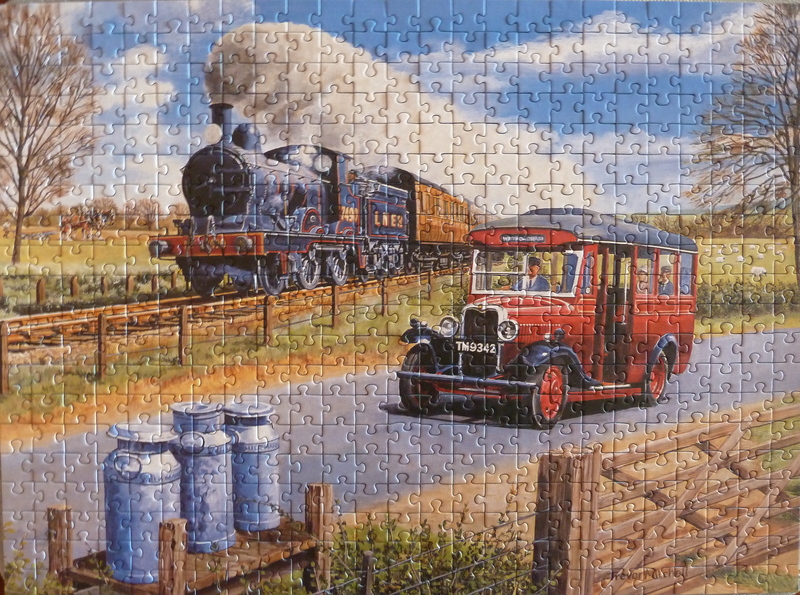 The first, Jigsaw-1, was hard … I liked the subject but the colours were quite dark and it took most of January to complete. I bought another one in late January whilst I was up in Kendal. I’d arrived early for my meeting at the college (I was their LSIS LiT Grant Project ‘critical friend’), so I had lunch in the town and wandered around the charity shops. This one was Jigsaw-2, it cost me £2 and took an age to build. I did have help though – Karen and Dave popped over for a weekend and she filled in some of the blue-sky bits; Carol and John are always popping in so Carol couldn’t resist doing some of the white bits. When I published the picture of Jigsaw-2 to Flickr, Claire responded from Ibiza – saying that the view was of Santorini, in Greece. And so it was – just search for Santorini on Google and compare those images to the Jigsaw. The colours were vibrant and it was sad to be finished with it. However, I now had the bug, so I bought another in Slaithwaite’s own charity shop for 50p. (50 pence!!!) which became Jigsaw-3. Now, this one had lots of blue sky and it took a while to complete but even so, it was very very relaxing. When you’re faced with a sky full of blue, the technique is to look at the shape of the piece and compare the slight changes in shading – as I say, this improves concentration. Still not sure about memory though. Anyway, I’m going to try and do one a month this year. Watch this space 😉 (or Flickr).